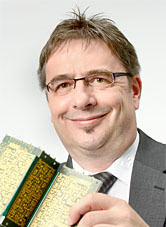 Bert Heinz, our expert regarding the topic thermal management, answers your technical questions from the webinar "Thermal management - Options for cooling components such as LEDs and high-power transistors using a circuit board". Please do not hesitate to ask Mr. Heinz via email! How do you solder circuit boards with Aluminium Heatsinks? Reflow soldering with convection and condensation (vapour phase). Due to the excellent heat dissipation, a longer pre-heating and cooling stage as well as time a longer period above the liquidus temperature should be taken into account. With optimum heat management, the soldering process is more difficult. Is printed circuit board glued to the heat sink after assembly? The circuit board is glued to the heatsink at Würth Elektronik before assembly. The gluing process requires defined temperatures, defined pressures and a vacuum. The thermal adhesive used is designed so that soldering and assembly processes are undertaken without any problems. However, after consultation with the product managers, there is the possibility to laminate the printed circuit board with thermal adhesive tape and deliver these boards to the customer without gluing a heatsink onto the board. After assembly, the customers with complex heatsinks can glue them onto the PCB. Micro vias can be filled with copper? Micro vias can be filled with copper, however the process leads to additional costs. The microvias are at least 80% filled with copper. What is the smallest non-"capped" Via final diameter required so that an outflowing of the solder during the soldering process does not occur? There have been no studies by Würth Elektronik into the Via final diameter required so that an outflowing of the solder during the soldering process does not occur. Since the heat flow depends on the copper cross-section in the z axis through the PCB, Via diameters smaller than 0.3 mm are not recommended. For Via diameters from 0.2 mm to 0.5 mm, filling and covering of the thermovias is recommended. Can you say, in percentage terms, how much more expensive filled vias are compared to unfilled vias? It depends on the complexity of the printed circuit board. The exact difference can be determined by a comparison quote. How can thermovias be identified in the CAD data? Must they be identified separately, in writing or orally, to the PCB manufacturer? In the current software programs, Thermovias cannot be specified. Thermal vias should be indicated in an appropriate manner and the PCB manufacturer should be told in writing. If thermovias are to be filled and capped, this should be specified alongside the drill diameters. How should thermovias (filled) be identified in the production data? Is it possible to create only one area with thermovias or does this not provide a cost benefit and all vias should be filled? It is easier in many cases to fill all vias than only fill vias in a specific area. If, for a specific reason, only some vias should be filled, this is also possible. The total number of vias, which are to be filled, has no influence on the price. What are the insulation values of the heat transfer adhesive used? Heat transfer adhesives with different insulation values are used. Typical values are 500 V and 3000 V.